Before reading this post, I want you to take a look at the website of Bryan Lewis Saunders, specifically the portion that describes his escapade through drugs and self-image. It can be found at http://www.bryanlewissaunders.org/drugs/. 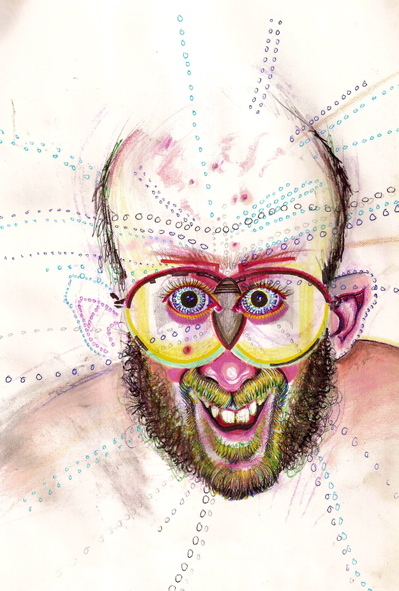 As a brief summary, Saunders took one drug a day for several weeks straight, and drew a self-portrait during the experience of each. Eventually, he changed to more sporadic use due to exhaustion and brain damage issues, but he did continue for quite a while. Saunders ranges the gamut from commonly known drugs such as Adderal, bath salts, and cocaine to more obscure Risperdol and Klonopin. The approach was clearly unscientific, it does delve into some interesting questions concerning our self-image, at least once you go past the initial, “this guy is crazy” response. Although I certainly won’t delve into all of them, I think it’s important to sometimes take a moment and ask them. First of all, it’s interesting to see how much our self-perception can be altered by something so seemingly trivial as a drug. We consider our image to be an integral part of us, yet it is easily changed. For those who study neuroscience, this is probably unsurprising, as we know that drugs change the chemistry of our body and brain, and are thus likely to alter self-image. However, the extent is quite amazing, if Saunder’s pseudo-experiment is any indication. “Magic mirror on the wall, who is the fairest one of all” says the evil Queen of Snow White and the Seven Dwarfs. I don’t deny that growing up on Disney gave me a somewhat skewed sense of reality at times. Wouldn’t it be nice to all have our own magic mirrors, constantly reminding us how wonderful and beautiful we are in the midst of the stress that is life?